The Cooking Photographer: Rolled Gingerbread Cookies, A Very Old Recipe. My poor husband has had enough, again. Our library looks like a book vomitorium, and I’m the guilty party. Books are everywhere, floor to ceiling, as my cookbook collecting habit strangles the room. There are books old and new all over the floor, seeping out into the hallway. Jesse spent much of the weekend trying to organize the chaos, but with little luck. I cannot help this though. Each book is a time stamp, holding history still while I absorb information, much of which has been lost to today’s cooks and bakers. Jesse will hopefully forgive me, as my collection grows into other rooms. I purchased a 1948 copy of Brer Rabbit’s New Orleans Molasses Recipes this past weekend at an antique store, but instead of baking from it, I found a more appealing recipe online and used that instead! Yeah, I am in so much trouble. Looking at the ingredients, I realized this recipe has very old roots. A good amount of vinegar is used to tenderize the dough, so that it can be rerolled quite a few times if needed. It may have been made with lard originally, because it needed an extra egg to get to gingerbread consistency with shortening. These cookies are real gingerbread, well ginger cookies really, leaving me to wonder why and when “bread” was eventually added. The cookie stamp comes in a kit from Williams Sonoma. We had a lot of fun making up sayings and putting in the letters. Of course not all of our words where um, holiday appropriate, but they made me burst into evil giggles. We ate all these though, and only the happy cheerful ones remain in my freezer. In a stand mixer, cream shortening and sugar. Beat in eggs, molasses, and vinegar. Add the salt, ginger, cinnamon, and cloves and mix to combine. Add the baking soda and mix in. Add the flour about 1/3 at a time and mix until combined. Spoon the dough about equally onto three pieces of wax paper. Wrap up, press into a 1 inch disk, and store in a gallon size bag. Chill dough for several hours or overnight. Remove the dough from the refrigerator and sit on the counter for about 30 minutes. Meanwhile preheat them oven to 375 degrees and cover cookie sheets with parchment paper. Place a disk between two sheets of new wax paper. Roll 1/8 to ¼ inch thick. *If dough sticks to wax paper, flour lightly until it stops sticking* Cut out shapes and place on parchment 2 inches apart. Bake for 6 to 9 minutes depending on the size thickness of your cookies, or until no longer wet looking. Cool on cookie sheets for a few minutes, then move to wire cooling racks. Once cooled, decorate as desired. Want to fancy up your gingerbread? This is a fantastic royal icing recipe. If you have a kitchen scale, use it. You’ll get much more accurate results. A very small dash of lemon, vanilla, almond, or other extract or oil of your choice. In a stand mixer fluff up the powdered sugar to break up any clumps. Add the egg white, cream of tarter, and extract. Beat on low spend until mixed, then on high speed for 5 minutes. Cover the extra icing with a damp towel while using, or store in an airtight container right away as the icing will harden immediately. To thin the icing, add a half teaspoon of water at a time until desired constancy. Ginger Cookie recipe adapted from COOKS.COM. Royal icing recipe adapted from “Gingerbread House Book” by Ella Harris. Book is in her Bake and Build Gingerbread House Book & Kit. PS - I can relate to your cookbook collection. I have them stacked all over the place. My designated bookshelves cannot hold any more! I'm constantly searching for a particular book - could be in the office, the bedroom, the dining room, etc. Ug! Those cookbooks tend to multiply like the fishes and loaves:) I am guilty of the same obsession. I ate "Eat Me" first... Or was it "Bite Me"? Lol they all tasted the same. Hi Laura, the cookies are adorable, just yesterday I saw the cutters on Williams-Sonoma. They are very cute. PS: I reply to your email. Cute cookies, the stamped greetings are so fun. I am pretty sure that cookbook over load is a conditions we can all relate to. I have a ton of cookbooks that I can't seem to find the time to actually use, but I keep buying em'. These are super cute! PS... I don't know how you keep up with MySpace & your blog! You are very busy! I love those cookie stamps. I'm slapping my hand as I type this. The pictures are terrific. They look soo gorgeous.. I'd eat tons of them!! Oh I love the inappropriate cookies!I'm always in trouble with the library because I keep forgetting to return the books - ensuing in fines *blush*. Doesn't help that the eldest daughter is a bookworm too, we take home close to 30 books sometimes - so I completely understand your filing system. Vomitorium? HA HA! :) I saw those on the Williams-Sonoma site, but thought the words were set, didn't realize you could arrange the letters:) Your cookies are really cute! I have a great gingerbread cookie recipe that I use every year and I love it! Love this post! I am a self professed cookbook junkie!!! It took the movers way too much time to pack them all. I would LOVE to have a first edtion of Julia Child's first cookbook!! I know what you mean about the cookbooks. I occasionally have to thin out and get rid of some. The cookies are just adorable. The cookies look great. Love gingerbread. My husband has a cookbook obsession...I'm telling you he has more cookbooks than our public library! Gingerbread is a tradition in my house every year. I love your cute little boys and the words make it! Personalized is the only way to go. This looks so delicious, I can't wait to try it. Vinegar tenderizes the dough, so that you can reroll it quite a few times. It's really nice to work with! Let me know if you try it & how it turns out. Like I said it's been probably 4 or 5 years since I made it. thats owesome cookies. thanks fo it. Caroline thank-you!!! I'm looking forward to trying it. I wish you had a blog, you are so awesomely talented. I also understand you are super busy. Hi Everyone! Thank-you and so sorry I haven't been around much. Oh, yeah -- those old recipes with vinegar in them are the best! Still important not to overwork the dough, but the vinegar definitely helps. As for the cookbook collecting problem... when you find a solution to that, let me know!! These cookies are adorable Laura! I am so making them! Thanks, Laura! 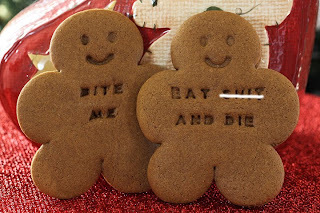 I was just about to make gingerbread men tonight for the nephews. :) What perfect timing! Don't you just love old cookbooks?? They are like a piece of history. Yes, I could add cookbook addiction (I mean collecting) to my other vices. I have to try this recipe with vinegar...just the sound of tenderizing the dough is appealing. I have yet to try this cutter from WS. Love all of your versions! Very awesome and cute idea..this is perfect for Christmas to serve for the family!! I adore the cookie stamps, they are so cute! they're the cutest gingerbread cookies! how cute! 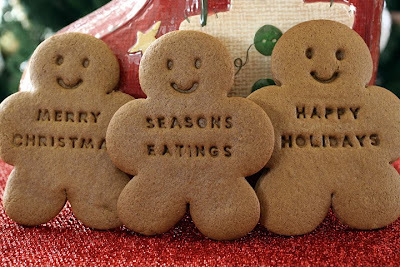 i just love your blog and this lovely gingerbread idea! Thanks for posting this-I've been using a recipe that calls for Corn Syrup and was looking for something more natural. For the shortening, did you use butter or margerine or something else? Were the cookies quite crunchy? or more chewy? I got some great animal cookie cutters from Ikea that I've been dying to use on roll out cookies (moose, squirrel, porcupine, fox, and bear!) Thanks! Those cutters will make super cute cookies! You can't swap the shortening easily though, the reason for it is so that the cookies will keep their shape when baked. One thing you could try though, is if you have access to good quality lard you might try that. I am guessing this recipe once used lard, because it called for only one egg. So if you try lard, use one less egg and add it to the end if the dough looks much too dry. I hope this helps some. I will be out of range for awhile. Thanks for the tips-I'll see if I can get lard at my co-op! Laura, I hope everything goes well for your mom! Merry Christmas to you and your family! Love the cookie stamps! So cute! About how many are in 1 batch? Wondering if I should double it... Thanks!! This recipe makes a ton of cookies. I can't remember how many, but I do remember thinking it was a double batch. About the raisins, don't wet them if you are going to roll the dough out unless they are really dry. Add more flour if the dough is too wet. This recipe was written so many years ago our ingredients are different now.